Nothing tastes quite like charcoal grilled skewers. 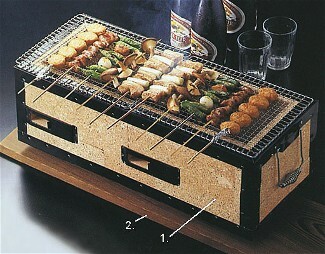 Now you can make delicious grilled dishes on your patio tabletop with this convenient Japanese style charcoal grill. Japanese charcoal (sumi or binchotan) tends to burn cleaner and hotter than the usual briquettes and can be used at the table, so no one misses the party or picnic tending to the grill. Makes food taste great! For OUTDOOR use only! Wooden base is optional (base is #2 in the picture). This item may be subject to extra shipping fees depending on zip code. Click the button below to add the Japanese Konro Charcoal Grill to your wish list.